Today’s podcast interviewee is Craig Richardson. Craig actually wrote in and suggested the subject for this podcast. 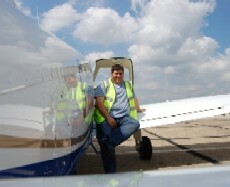 He’s at the point in his flying career where he’s about to launch into training for the ATPL and he’s trying to decide where to do his ATPL groundschool studies and the CPL/IR flight training. He thought that the decision making process that he’s going through would make for an interesting podcast. Craig has done a great deal of research: on-line via aviation forums, by visiting flight training exhibitions and by talking to the training suppliers themselves. Today we discuss which training providers made it on to Craig’s short-list, get an idea for which companies he’s thinking of going with and, of course, why he chose them.